The only correct way of writing triggers is not writing them. I would repeat – the only correct way of writing triggers is not writing them. Triggers negatively affect performance. AFTER triggers introduce fragmentation and increase tempdb load due to version store usage. Triggers are running in context of transaction, increase the time in which locks are held and contribute to locking and blocking in the system. However, in some cases, we have to use triggers and it is important to develop them correctly. Everything is fine when you inserted a single row. However, multi-row insert would fail with exception shown below. And there is another consequence of statement-level nature of triggers. They fire even if DML statement did not modify any rows. Would it introduce any issues in the system or not depends on implementation. However, it would always lead to unnecessary performance overhead. Let’s look at example. The code below creates another table and changes trigger in a way, that mimics behavior of audit functional, which is frequently implemented based on triggers. Now let’s run insert statement, which does not insert any rows to the table. So the first important conclusion is that every trigger must checks @@ROWCOUNT variable as the very first statement in implementation. SET NOCOUNT ON should be the second action trigger does. Without that SQL Server returns affected number of rows for each operator in the trigger in addition to original DML statement. Some client libraries rely on the single message in the output and would not work correctly in case of multiple messages. Therefore, the first two statements in the trigger should look like it is shown below. Finally, there is another caveat. While implementation above works for insert, update and delete operators, it is not the case with merge. @@ROWCOUNT in this case represents total number of rows affected by merge statement rather than by individual insert, update or delete action in the trigger. Let’s prove it with the example. The table is empty, therefore only one insert statement would be executed. However, as you should see below, all three triggers were fired, It is worth mentioning that previous code example demonstrated very bad practice of returning result sets from trigger. You should avoid doing it in production code. The right way to deal with such situation is checking content of inserted and deleted tables as shown below. I hope that those tips will help you to write trigger in the most optimal way. However, I would repeat – the best way of writing triggers is not writing them at all. This entry was posted in SQL Server 2005, SQL Server 2008, SQL Server 2012, T-SQL and tagged T-SQL, Triggers on January 28, 2014 by Dmitri Korotkevitch. One of the questions I have often been asked during various SQL Server events is what exactly Table Spool operator does in execution plan. I would try to answer it today. Spool operators, in the nutshell, are internal in-memory or on-disk caches/temporary tables. SQL Server often uses spools for performance reasons to cache results of complex subexpressions that needs to be used multiple times during query execution. Now let’s run the query that returns the list of orders with the information about total amount of sales on per-customer basis. As you see, in the execution plan below, SQL Server scans the table, sorts the data based on CustomerID order and uses Table Spool operator to cache the results. It allows SQL Server to access the cached data and avoid expensive sorting operation later. Even though Table Spool operator is shown in the execution plan multiple times, it is essential the same spool/cache. SQL Server builds it the first time and using its data later. Technically speaking, there are two different logical spool operators – Eager Spool and Lazy Spool. The only difference between them are how data is populated. With Eager Spool, SQL Server fetches all rows as soon as spool is called. With Lazy Spool, SQL Server fetches rows on demand – when they are needed. SQL Server also uses spools for Halloween Protection when modifying the data. Halloween Protection helps to avoid situations when data modifications affect what data need to be updated. The classic example of such situation is shown below. Without Halloween Protection, insert statement would fall into infinitive loop, reading rows it has been inserting. As you can see in the execution plan of insert statement, SQL Server uses Table Spool operator to cache the data from table as of before insert starts to avoid infinitive loop during execution. 02. Halloween Protection and Table Spools. Halloween Protection has very interesting side-effect when we are talking about multi-statement user-defined functions (both, scalars and table-valued). Using multi-statement functions is bad practice by itself, however creating them without SCHEMABINDING option is even worse. That option forces SQL Server to analyze if user-defined function performs data access and avoid extra Halloween Protection-related Spool operators in the execution plan. Let’s see the example and create two user-defined functions and using them in where clause of update statements. Neither of functions access the data and therefore can introduce Halloween effect. However, SQL Server does not know that in case of non-schema bound function and add Spool operator to execution plan as shown below. Bottom line – you should always make functions schema-bound when you create them. Spool temporary tables are usually referenced as worktables in I/O statistics for the queries. You should analyze table spool-related reads during query performance tuning. While spools can improve performance of the queries, there is the overhead introduced by unnecessary spools. You can often remove them by creating appropriate indexes on the tables. This entry was posted in SQL Server 2005, SQL Server 2008, SQL Server 2012, T-SQL and tagged Execution Plan, Operators, Table Spool on January 7, 2014 by Dmitri Korotkevitch. Heap tables are tables without a clustered index. The data in heap tables is unsorted. 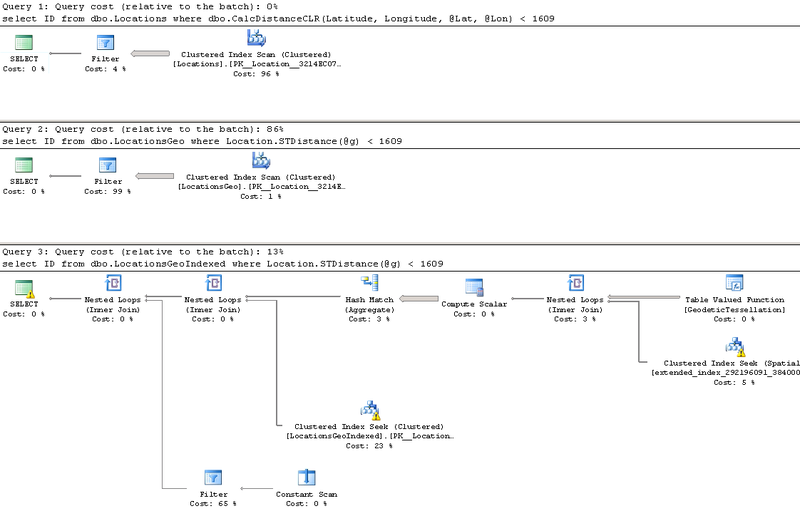 SQL Server does not guarantee nor maintain any sorting order of the data in the heap tables. When we insert data into heap tables, SQL Server tries to fill pages as much as possible, although it does not analyze the actual free space available on a page. It uses the Page Free Space (PFS) allocation map instead. SQL Server errs on the side of caution, and it uses the low value from the PFS free space percentage tier during the estimation. For example, if a data page stores 4,100 bytes of data, and, as result, has 3,960 bytes of free space available, PFS would indicate that the page is 51-80 percent full. SQL Server would not put a new row to the page if its size exceeds 20 percent (8,060 bytes * 0.2 = 1,612 bytes) of the page size. Let’s look at the example and create the table with the code shown below. At this point, the table stores 20 rows of 4,100 bytes each. SQL Server allocates 20 data pages—one page per row—with 3,960 bytes available. PFS would indicate that pages are 51-80 percent full. As the next step, let’s inserts the small 111-byte row, which is about 1.4 percent of the page size. 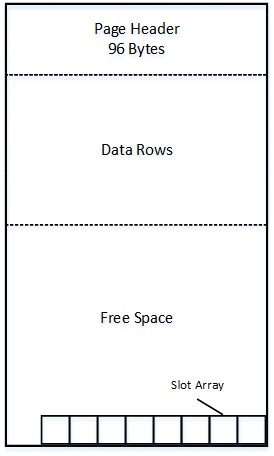 As a result, SQL Server knows that the row would fit into one of the existing pages (they all have at least 20 percent of free space available), and a new page should not be allocated. Lastly, the third insert statement needs 2,011 bytes for the row, which is about 25 percent of the page size. SQL Server does not know if any of the existing pages have enough free space to accommodate the row and, as a result, allocates the new page. You can see that SQL Server does not access existing pages by checking the actual free space and uses PFS data for the estimation. That behavior leads to the situation where SQL Server unnecessarily allocates new data pages, leaving large amount of free space unused. It is not always a problem when the size of rows vary—in those cases, SQL Server eventually fills empty spaces with the smaller rows. However, especially in cases when all rows are relatively large, you can end up with large amounts of wasted space. When selecting data from the heap table, SQL Server uses as Index Allocation Map (IAM) to find the pages and extents that need to be scanned. It analyzes what extents belong to the table and processes them based on their allocation order rather than on the order in which the data was inserted. You can see it in figure below. When you update the row in the heap table, SQL Server tries to accommodate it on the same page. If there is no free space available, SQL Server moves the new version of the row to another page and replaces the old row with a special 16-byte row called a forwarding pointer. The new version of the row is called forwarded row. There are two main reasons why forwarding pointers are used. First, they prevent updates of nonclustered index keys, which referencing the row. 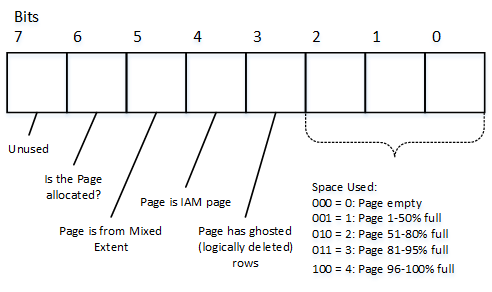 In addition, forwarding pointers helps minimize the number of duplicated reads – the situation when a single row is read multiple times during the table scan. As the example, let’s look at figure above and assume that SQL Server scans the pages in left-to-right order. Next, let’s assume that the row in page 3 was modified after the page was read at the time when SQL Server reads page 4. The new version of the row would be moved to page 5, which has yet to be processed. Without forwarding pointers, SQL Server would not know that the old version of the row had already been read, and it would read it again during the page 5 scan. With forwarding pointers, SQL Server would ignore the forwarded rows. Forwarding pointers help minimize duplicated reads at cost of additional read operations. SQL Server follows the forwarding pointers and reads the new versions of the rows at the time it encounters them. That behavior can introduce an excessive number of I/O operations. Let’s create the table and insert three rows there. 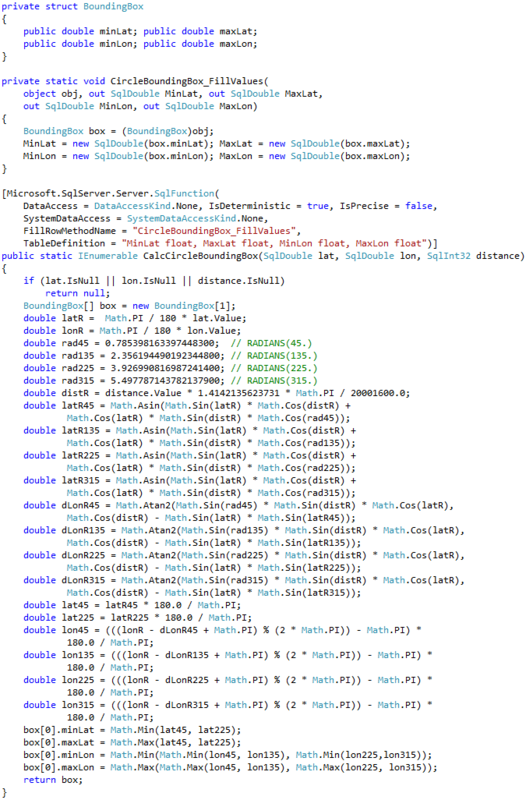 All three rows fit into the single page, and SQL Server needs to read just that page when it scans the table. Let’s update two of the table rows and increase their size. The new version of the rows would not fit into the page anymore, which introduces the allocation of the two new pages and two forwarding pointers. When SQL Server reads the forwarding pointer rows from page 1, it follows them and reads pages 2 and 3 immediately thereafter. After that, SQL Server reads those pages one more time during the regular IAM scan process. As a result, we have five read operations, even though our table has just three data pages. It does not look as bad in case of the small table. Let’s look at the same issue in case, when table has more rows. Let’s insert 65,536 rows to our table. As you see, there are 106 pages in the table and as result, SQL Server performs 106 reads during IAM scan. Let’s update our table and introduce forwarding pointers. Now our table has 4,461 pages however it requires almost 70 thousand reads to perform a scan. As you see, the large number of the forwarding pointers leads to extra I/O operations and significantly reduces the performance of the queries accessing the data. When the size of the forwarded row is reduced by another update and the data page with forwarding pointer has enough space to accommodate updated version of the row, SQL Server might move it back to original data page and remove the forwarding pointer. Nevertheless, the only reliable way to get rid of the all forwarding pointers is by rebuilding the heap table. You can do that by using an ALTER TABLE REBUILD statement or by creating and dropping a clustered index on the table. Heap tables can be useful in staging environment where you want to import a large amount of data into the system as fast as possible. Inserting data into heap tables can often be faster than inserting it into tables with clustered indexes. Nevertheless, during a regular workload, tables with clustered indexes usually outperform heap tables due to their suboptimal space control and forwarding pointers. This entry was posted in SQL Server 2005, SQL Server 2008, SQL Server 2012 and tagged Internal Structure, Storage Engine on December 17, 2013 by Dmitri Korotkevitch. As you already know, the fixed-length data and the internal attributes of a row must fit into a single page. Fortunately, SQL Server can store the variable-length data on different data pages. There are two different ways to store the data, depending on the data type and length. SQL Server stores variable-length column data, which does not exceed 8,000 bytes, on special pages called ROW_OVERFLOW pages. Let’s create a table and populate it with the data shown in listing below. SQL Server creates the table and inserts the data row without any errors, even though the data row size exceeds 8,060 bytes. Let’s look at the table page allocation using the DBCC IND command. Now you can see two different sets of IAM and data pages. The data page with PageType=3 represents the data page that stores ROW_OVERFLOW data. Let’s look at data page 214647, which is the in-row data page that stores main row data. The partial output of the DBCC PAGE command for the page (1:214647) is shown below. As you see, SQL Server stores Col1 data in-row. Col2 data, however, has been replaced with a 24-byte value. The first 16 bytes are used to store off-row storage metadata attributes, such as type, length of the data, and a few other attributes. The last 8 bytes is the actual pointer to the row on the row-overflow page, which is the file, page, and slot number. Figure below shows this in detail. Remember that all information is stored in byte-swapped order. As you see, the slot number is 0, file number is 1, and page number is the hexadecimal value 0x00034675, which is decimal 214645. The page number matches the DBCC IND results shown earlier in the post. The partial output of the DBCC PAGE command for the page (1:214645) is shown below. Col2 data is stored in the first slot on the page. For the text, ntext, or image columns, SQL Server stores the data off-row by default. It uses another kind of page called LOB data pages. You can control this behavior by using the “text in row” table option. For example, exec sp_table_option dbo.MyTable, ‘text in row’, 200 forces SQL Server to store LOB data less or equal to 200 bytes in-row. LOB data greater than 200 bytes would be stored in LOB pages. The logical LOB data structure is shown below. Like ROW_OVERFLOW data, there is a pointer to another piece of information called the LOB root structure, which contains a set of the pointers to other data pages/rows. When LOB data is less than 32 KB and can fit into five data pages, the LOB root structure contains the pointers to the actual chunks of LOB data. Otherwise, the LOB tree starts to include an additional, intermediate level of pointers, similar to the index B-Tree. Let’s create the table and insert one row of data there. The page allocation for the table is shown below. As you see, the table has one data page for in-row data and three data pages for LOB data. I am not going to examine the structure of the data row for in-row allocation; it is similar to the ROW_OVERFLOW allocation. However, with the LOB allocation, it stores less metadata information in the pointer and uses 16 bytes rather than the 24 bytes required by the ROW_OVERFLOW pointer. The result of DBCC PAGE command for the page that stores the LOB root structure is shown below. As you see, there are two pointers to the other pages with LOB data blocks, which are similar to the blob data stored in ROW_OVERFLOW pages. The format, in which SQL Server stores the data from the (MAX) columns, such as varchar(max), nvarchar(max), and varbinary(max), depends on the actual data size. SQL Server stores it in-row when possible. When in-row allocation is impossible, and data size is less or equal to 8,000 bytes, it stored as ROW_OVERFLOW data. The data that exceeds 8,000 bytes is stored as LOB data. 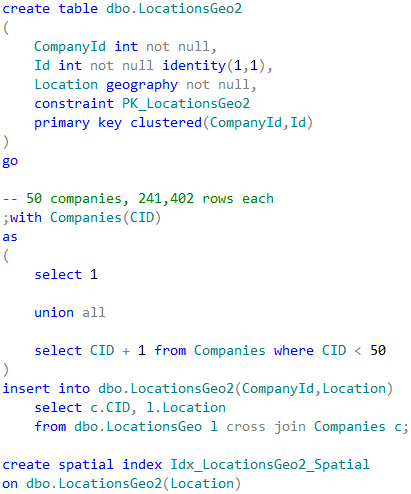 It is also worth mentioning that SQL Server always stores rows that fit into a single page using in-row allocations. When a page does not have enough free space to accommodate a row, SQL Server allocates a new page and places the row there rather than placing it on the half-full page and moving some of the data to ROW_OVERFLOW pages. There are plenty of reasons why selecting all columns from a table with the select * operator is not a good idea. It increases network traffic by transmitting columns that the client application does not need. It also makes query performance tuning more complicated, and it introduces side effects when the table schema changes. It is recommended that you avoid such a pattern and explicitly specify the list of columns needed by the client application. This is especially important with ROW_OVERFLOW and LOB storage, when one row can have data stored in multiple data pages. SQL Server needs to read all of those pages, which can significantly decrease the performance of queries. As an example, let’s assume that we have table dbo.Employees with one column storing employee pictures. The table has 1,024 rows with binary data of 120,000 bytes. Let’s assume that we have code in the client application that needs the EmployeeId and Name to populate a drop-down box. If a developer is not careful, he can write a select statement using the select * pattern, even though a picture is not needed for this particular use-case. Let’s compare the performance of two selects; one selecting all data columns and another that selects only EmployeeId and Name. As you see, the first select, which reads the LOB data and transmits it to the client, is a few orders of magnitude slower than the second select. One case where this becomes extremely important is with client applications, which use Object Relational Mapping (ORM) frameworks. Developers tend to reuse the same entity objects in different parts of an application. As a result, an application may load all attributes/columns even though it does not need all of them in many cases. It is better to define different entities with a minimum set of required attributes on an individual use-case basis. In our example, it would work best to create separate entities/classes, such as EmployeeList and EmployeeProperties. An EmployeeList entity would have two attributes: EmployeeId and Name. EmployeeProperties would include a Picture attribute in addition to the two mentioned. This approach can significantly improve the performance of systems. 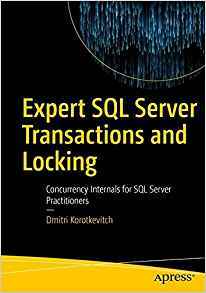 This entry was posted in General, SQL Server 2005, SQL Server 2008, SQL Server 2012 and tagged Internal Structure, Storage Engine on November 5, 2013 by Dmitri Korotkevitch. The space in the database divided into logical 8KB pages. Those pages are continuously numbered starting with zero and can be referenced by specifying a file ID and a page number. The page numbering is always continuous – when SQL Server grows the database file, the new pages would have the numbers starting from the last highest page number in the file plus one. Similar, when SQL Server shrinks the file, it removes the highest number pages from the file. Let’s look at the structure of a data page. All images are clickable. 96-bytes page header contains the various information about a page , such as the object page belongs; number of rows and amount of free space available on the page; links to the previous and next pages if the page is in an index page chain, and so on. Following the page header is the area where actual data is stored. It is followed by the free space. Finally, there is the slot array, which is the block of 2-byte entries indicating the offset at which the corresponding data rows begin on the page. Slot array indicates the logical order of the data rows on the page. In case, if data on the page needs to be sorted in the order of the index key, SQL Server does not physically sort the data rows on the page but rather populates slot array based on the index sort order. The slot 0 (right-most) stores the offset for the data row with the lowest key value on the page, slot 1 – to the second lowest key value and so forth. SQL Server system data types can be logically separated into two different groups, such as fixed-length and variable-length types. Fixed-length data types, such as int, datetime, char and others always use the same storage space regardless of the value even when it is NULL. For example, int column always uses 4 bytes and nchar(10) column always uses 20 bytes to store the information. As the opposite, variable-length data types, such as varchar, varbinary and a few others, use as much storage space as required to store the data plus two extra bytes. For example nvarchar(4000) column would use only 12 bytes to store five characters string and, in most part of the cases, 2 bytes to store NULL value. We will discuss the case when variable-length columns do not use storage space for NULL values later. The first 2 bytes of the row, called Status Bits A and Status Bits B, are the bitmaps containing the information about the row, such as row type; if the row has been logically deleted (ghosted); if the row has NULL values, variable-length columns and versioning tag. The next two bytes in the row are used to store the length of the fixed-length portion of the data. They are followed by fixed-length data itself. After the fixed-length data portion, there is the null bitmap, which includes two different data elements. The first 2-byte element is the number of columns in the row. It is followed by null bitmap array. That array is using one bit per every column from the table regardless if it is nullable or not. The null bitmap is always present in the data rows in heap tables or clustered index leaf rows even when table does not have nullable columns. Although, the null bitmap is not present in non-leaf index rows nor leaf level rows of nonclustered indexes when there are no nullable columns in the index. Following the null bitmap, there is the variable-length data portion of the row. It starts with two-byte number of variable-length columns in the row followed by variable-length column offset array. 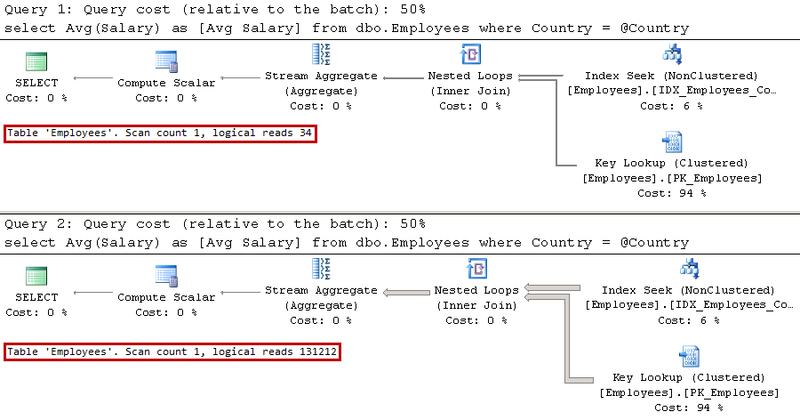 SQL Server stores two-byte offset value per each variable-length column in the row even when value is null. It followed by the actual variable-length portion of the data. Finally, there is optional 14-bytes versioning tag at the end of the row. That tag is used during the operations, which require row-versioning, such as online index rebuild, optimistic isolation level and others. Let’s look at the example. First, let’s create the table, populate it with some data and look at the actual row data. Undocumented but well-known DBCC IND command returns us the information about table page allocations. There are two pages that belong to the table. The first one with PageType=10 is the special type of the page called IAM allocation map. This page tracks the pages that belong to particular object. Let’s not focus on it now – we will cover allocation map pages in one of the following blog posts. You can see the output of DBCC PAGE that corresponds to the first data row below. SQL Server stores the data in byte-swapped order. For example, two-byte value of 0001 would be stored as 0100. As you see, the row starts with the two status bits bytes following by two-byte value of 0800. This is byte-swapped value of 0008, which is the offset for the number of columns attribute in the row. This offset tells SQL Server where fixed-length data part of the row ends. Next four bytes are used to store fixed-length data, which is ID column in our case. After that, there is the two-byte value that shows that data row has four columns followed by one-byte NULL bitmap. With just four columns one byte in the bitmap is enough. It stores the value of 04, which is 00000100 in the binary format. It indicates that the third column in the row contains NULL value. The next two bytes stores the number of variable-length columns in the row, which is 3 (0300 in byte-swapped order). It follows by offset array, each two bytes there stores the offset where variable-length column data ends. As you see, even though Col2 is NULL, it still uses the slot in the offset-array. Finally, there is the actual data from variable-length columns. Now let’s look at the second data row. The NULL bitmap in the second row represents binary value of 00001010, which shows that Col1 and Col3 are NULL. Even though the table has three variable-length columns, number of variable-length columns in the row indicates, that there are just two columns/slots in the offset-array. SQL Server does not maintain the information about the trailing NULL variable-length columns in the row. You can reduce the size of data row by creating tables in the way, when variable-length columns that often have null values are the last ones in the table definition. 2 bytes for Status Bits bytes + 2 bytes for fixed-length data length + 4 bytes for ID column storage + 2 bytes for number of column + 1 byte for null bitmap + 2 bytes for number of variable-length columns + 6 bytes (3 * 2 bytes) for variable-length offset array – (2 bytes * number of trailing variable-length columns with null value) + variable-length data + 2 bytes for slot array = 21 bytes to store fixed-length data and overhead + length of variable-length data – (2 bytes * number of trailing variable-length columns with null value). This approach can help you to calculate the actual size of the data rows in the table. Do not forget, that non-clustered indexes do not have null bitmap array in case if there are no nullable columns in the index. The fixed-length data and internal attributes must fit into 8,060 bytes available on the single data page. SQL Server does not allow you to create the table when this is not the case. For example, the code below produces an error. Creating or altering table 'BadTable' failed because the minimum row size would be 8067, including 7 bytes of internal overhead. This exceeds the maximum allowable table row size of 8060 bytes. This entry was posted in General, SQL Server 2005, SQL Server 2008, SQL Server 2012 and tagged Internal Structure, Storage Engine on October 15, 2013 by Dmitri Korotkevitch. In the next a few months I will talk a bit about SQL Server Storage Engine covering how SQL Server stores the data; what is the format of data row and data page; what are the allocation maps; and so on. We will see how it goes and where to stop. Today I will start writing a few words about SQL Server database files and filegroups in general. SQL Server database is a collection of the objects that allow us to store and manipulate the data. In theory, SQL Server supports 32,767 databases per instance although the typical installation usually has just several databases. Obviously, the number of the databases SQL Server can handle depends on the load and hardware. It is not unusual to see the servers hosting dozens or even hundreds of small databases. Every database consists of one or more transaction log and one or more data files. Transaction log stores the information about database transactions and all data modifications made by each session. Every time the data has been modified, SQL Server stores enough information in the transaction log to undo (rollback) or redo (replay) the action. Every database has one primary data file, which, by default, has .mdf extension. In addition, every database can have secondary database files. Those files, by default, have .ndf extension. All database files are grouped into the filegroups. Filegroup is the logical unit, which simplifies database administration. They allow the separation between logical object placement and physical database files. When you create the database objects-tables, for example-you specify in what filegroup they should be placed without worrying about underlying data files configuration. The script shown below creates the database with name OrderEntryDb. That database consists of three filegroups. The primary filegroup has one data file stored on M: drive. Second filegroup- Entities– has one data file on N: drive. Last filegroup- Orders– has two data files stored on O: and P: drives. Finally, there is the transaction log file on L: drive. You can see the physical layout of the database and data files below. There are five disks with four data- and one transaction- log files. Dashed rectangles represent the filegroups. Ability to put multiple data files inside the filegroup allows us to spread the load across different storage devices, which would help to improve I/O performance of the system. Transaction log, on the other hand, does not benefit from the multiple files. SQL Server works with transaction log in sequential matter and multple log files just stay idle. Let’s create a few tables in the database we created. The tables Clients and Articles are placed into Entities filegroup. The table Orders resides in Orders filegroup. The physical layout of the tables in the database and disks is shown below. The separation between logical object placement in the filegroups and physical database files allow us to fine-tune the database file layout getting the most from the storage subsystem. For example, independent software vendors (ISV), who are deploying their products to different customers, can adjust the number of database files based on underlying I/O configuration and expected amount of the data during deployment stage. Those changes would be transparent to the developers, who are placing the database objects to the filegroups rather than database files. It is generally recommended to avoid using PRIMARY filegroup for anything but system objects. Creating separate filegroup or set of the filegroups for the user objects simplifies database administration and disaster recovery especially in case of the large databases. You can specify initial file size and auto-growth parameters at time when you create the database or add new files to existing database. SQL Server uses proportional fill algorithm when choosing in what data file it should write data to. It writes an amount of data proportionally to the free space available in the files – more free space are in the file, more writes it would handle. I would recommend that all files in the single filegroup would have the same initial size and auto-growth parameters with grow size defined in megabytes rather than percent. This would help proportional fill algorithm evenly balance write activities across data files. Every time SQL Server grows the files, it fills newly allocated space in the files with zeros. That process blocks all sessions that need to write to the corresponding file or, in case of transaction log growth, generate transaction log records. 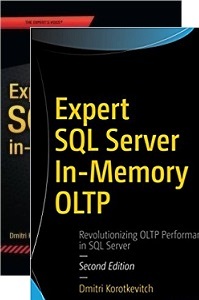 SQL Server always zeroing out transaction log and that behavior cannot be changed. Although, you can control if data files are zeroing out or not by enabling or disabling Instant File Initialization. Enabling Instant File Initialization helps to speed up data file growth and reduces the time required to create or restore the database. There is the small security risk associated with Instant File Initialization. When this option is enabled, unallocated part of the data file can contain the information from the previously deleted OS files. Database administrators will be able to examine such data. You can enable Instant File Initialization by adding SA_MANAGE_VOLUME_NAME permission also known as “Perform Volume Maintenance Task” to SQL Server startup account. This can be done under Local Security Policy management application (secpol.msc) as shown below. You need to open properties for “Perform volume maintenance task” permission and add SQL Server startup account to the list of users there. SQL Server checks if it has Instant File Initialization enabled on startup. You need to restart SQL Server service after you add corresponding permission. In order to check if permission is enabled, you can use the code from the listing below. This code sets two trace flags that forces SQL Server to put additional information to the error log, creates the small database and reads the content of the log. In case, if Instant File Initialization is not enabled, SQL Server error log shows that SQL Server zeroing mdf data file in addition to zeroing log .ldf file as shown below. When Instant File Initialization is enabled, it would only mention zeroing of the log .ldf file. Another important database option that controls the database file sizes is Auto Shrink. When this option is enabled, SQL Server regularly shrinks the database files, reduces their size and release space to operating system. This operation is very resource intensive and rarely useful – the database files grow up again after some time when new data comes to the system. Auto Shrink must never be enabled on the database. Moreover, Microsoft would remove that option in the future versions of the SQL Server. 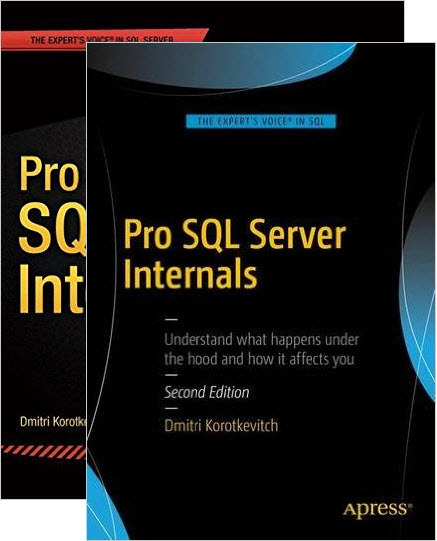 This entry was posted in General, SQL Server 2005, SQL Server 2008, SQL Server 2012 and tagged Internal Structure, Storage Engine on September 24, 2013 by Dmitri Korotkevitch. 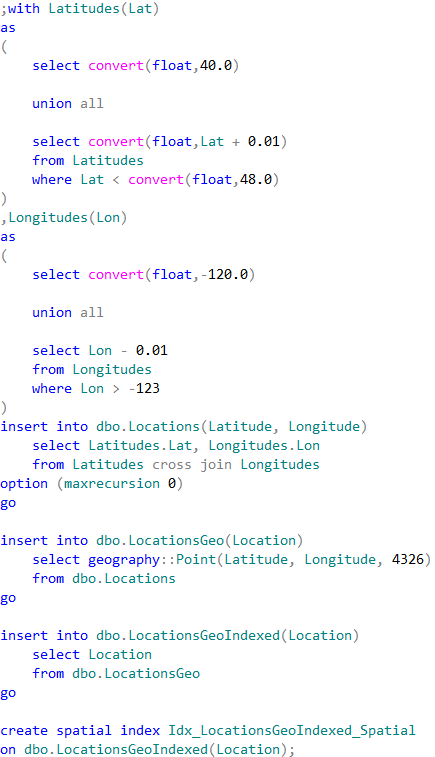 SQL Server supports two data types to store spatial information – geometry and geography. Geometry supports planar, or Euclidean, flat-earth data. Geography supports ellipsoidal round-earth surface. 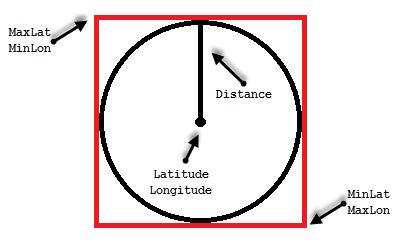 Both data types can be used to store location information, such as GPS latitude and longitude coordinates. Geography data type considers Earth roundness and provides slightly better accuracy although it has stricter requirements to the data. As a couple of examples, data must fit in the single hemisphere and polygons must be defined in specific ring orientation. 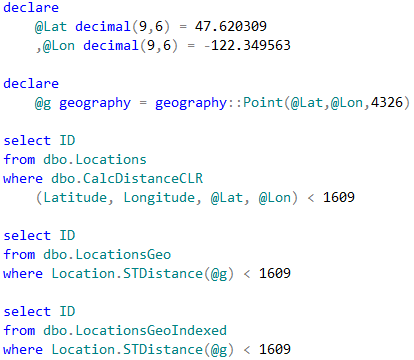 Storing location information in geometry data type introduces its own class of problems. It works fine and often has better performance than geography data type. Although, we cannot calculate the distance between points – the unit of measure for result is decimal degrees, which are useless in non-flat surface. 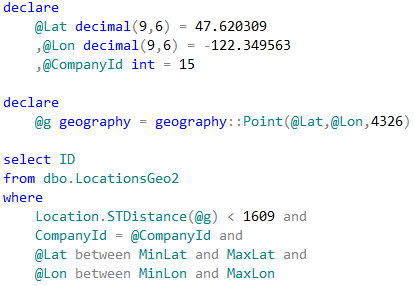 Let’s take a look at spatial data type performance in one of the specific use-cases, such as distance calculation between two points. Typical use-case for that scenario is the search for the point of interest (POI) close to specific location. First, let’s create three different tables storing POI information in the different format and populate them with some data. 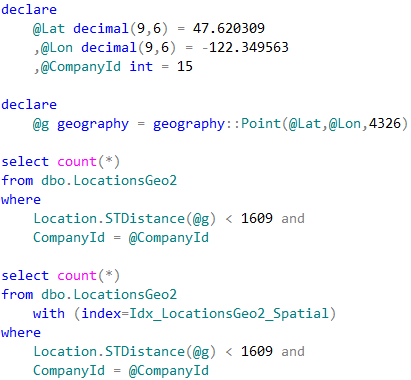 The first table dbo.Locations stores the coordinates using decimal(9,6) data type. Two other tables are using geography data type. 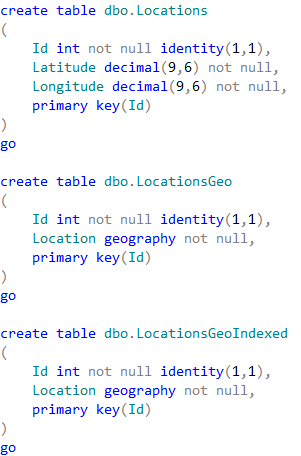 Finally, the table dbo.LocationsGeoIndexed has Location column indexed with special type of the index called spatial index. Those indexes help improving performance of some operations, for example distance calculation or check if objects are intersecting. It is worth mentioning that the first table uses decimal(9,6) data type rather than float. This decision saves us six bytes per pair of values and provides the accuracy that exceed the accuracy of commercial-grade GPS receivers. Let’s run the tests that measures performance of the queries that calculate the number of locations within one mile from Seattle City Center. 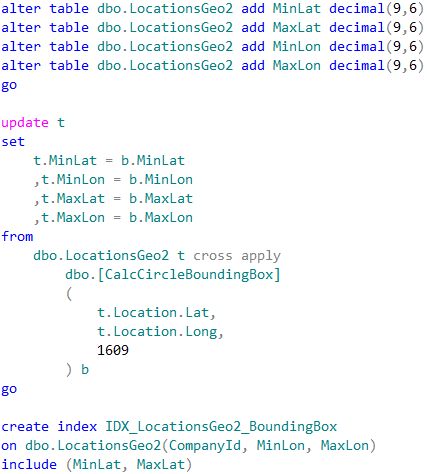 In case of dbo.Locations table, we will use dbo.CalcDistanceCLR function, which we defined earlier. For two other tables we will call spatial method STDistance. The first and second queries perform clustered index scan and calculate the distance for every row from the table. Last query uses spatial index to lookup such rows. We can see execution times for the queries in the table below. As we see, spatial index greatly benefits the query. It is also worth mentioning, that without the index, performance of CalcDistanceCLR method is better comparing to STDistance. Although spatial index greatly improves the performance, it has its own limitations. It works in the scope of entire table and all other predicates are evaluated after spatial index operations. That can introduce suboptimal plans in some cases. As the example, let’s look at the use-case, when we store POI information on company-by-company basis . In case, when we perform POI lookup for specific company, CompanyId column must be included as the predicate to the queries. SQL Server has two choices how to proceed. The first choice is clustered index seek based on CompanyId value calling STDistance method for every POI that belongs to the company. Another choice is using spatial index, find all POIs within the specified distance regardless of what company they belong and, finally, join it with the clustered index data. Let’s run those queries. Neither method is efficient in case when table stores the large amount of data for the large number of companies. Execution plan of the first query utilizing clustered index seek shows that it performed STDistance call 241,402 times – once per every company POI. The execution plan for the second query shows that spatial index lookup returned 550 rows – all POI in the area, regardless of what company they belong. 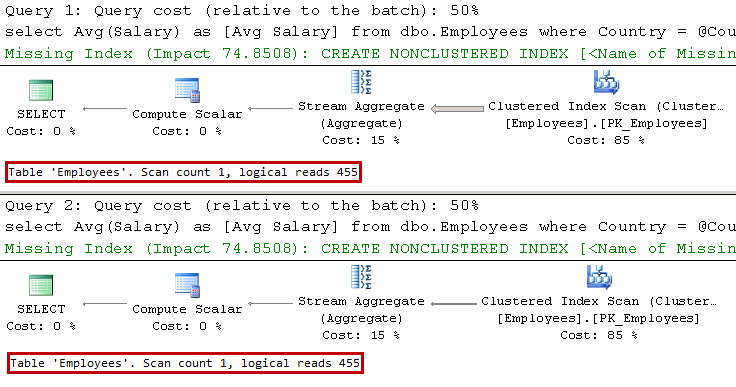 SQL Server had to join the rows with the clustered index before evaluating CompanyId predicate. One of the ways to solve such problem called Bounding Box approach. That method allows us to minimize the number of the calculations by filtering out POIs that are outside of the area of interest. All points we need to select residing in the circle with location as the center point and radius specified by the distance. The only points we need to evaluate are residing within the box that inscribes that circle. We can calculate the coordinates of the corner points of the box, persist it in the table and use regular non-clustered index to pre-filter the data. This would allow us to minimize the number of expensive distance calculations to perform. Calculation of the bounding box corner points can be done with CLR table-valued function shown below. Let’s alter our table and add bounding box points. We also need to create non-clustered index to support our query. Now, we can change the query to utilize the bounding box. As we see, bounding box outperforms both – clustered index seek and spatial index lookup. Obviously, it would be the case only when bounding box reduces the number of the calculations to degree that offsets the overhead of non-clustered index seek and key lookup operations. It is also worth mentioning that we do not need spatial index with such approach. We can use bounding box for the other use-cases. For example, when we are checking if position belongs to the area defined by the polygon. Bounding box corner coordinates should store minimum and maximum latitude/longitude of the polygon corner points. Similarly to the distance calculation, we would filter-out the locations outside of the box before performing expensive spatial method call that validates if point is within the polygon area. This entry was posted in SQL Server 2008, SQL Server 2012, T-SQL and tagged CLR, optimization, Spatial on September 3, 2013 by Dmitri Korotkevitch.